The Inspired Model© is founded upon principles of relational neurobiology, child and adolescent development, positive behaviour support and strengths-based psychology, as well as systems-based cognitive behaviour therapy. 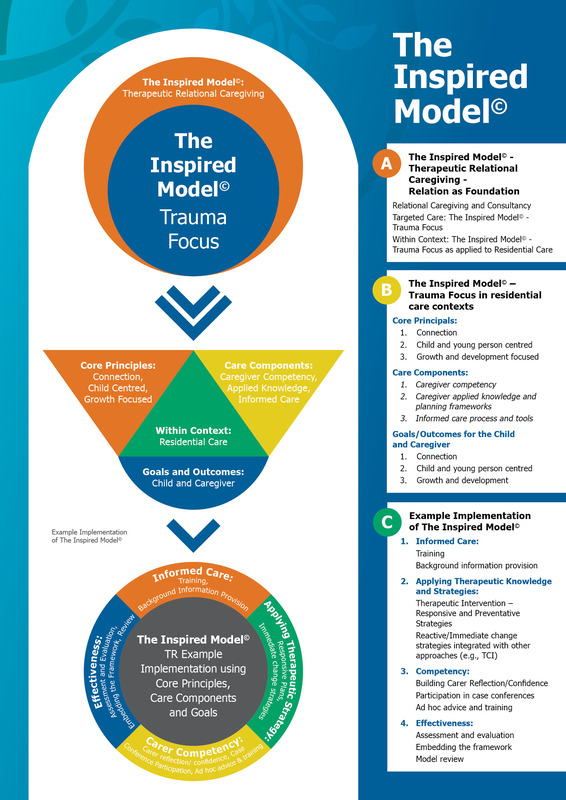 The Inspired Model© can be applied to both individuals and systems (e.g. families, education, out of home care). As such, the model informs both the provision of direct therapeutic intervention with children and young people, and also the provision of a relational therapeutic structure in supporting others involved in their care (e.g. staff, leadership team, mentors, teachers). Specifically, at the systems level (e.g. families; care teams) it provides a support structure to enable adults to competently therapeutically care for children and young people with view to helping them to reach their potential. The broader Inspired Model© can be flexibly adapted to address a range of presenting therapeutic issues, with specific knowledge or emphasis on the needs of the client and/or organisation. The framework is not prescriptive, but rather focuses on authenticity and the adaptation and development of skills and relational strengths already available to the individual or team. As such, it works well with existing approaches (e.g. Therapeutic Crisis Intervention). The Inspired Model© has been successfully utilised across residential care settings in the provision of therapeutic relational consulting; in our group program SociAble Kids/Teens which emphasises implicit/experiential and explicit relational/social learning; with families in family-based therapy and parenting support and in regard to individual therapy. It has been effectively used in systems-based intervention across a range of presenting issues including complex trauma; attachment concerns, disability, Autism Spectrum Disorders, mood disorders, ADHD as well as a range of other social-emotional and behavioural issues in children and adolescents. The function of the Inspired Model© – Trauma Focus is to support care teams/caregivers to better meet young people’s emotional-relational developmental needs, and in this way, to develop young people’s skills and capacities to realise their potential more globally in their development. The aim of the Inspired Model© – Trauma Focus is to increase responsiveness and develop and maintain an informed, proactive carer focus on the long-term growth and development of a child or young person, rather than reaction and risk management. The graphic shows an example application of the Inspired Model© – Trauma Focus within context- specifically in this instance within a residential care setting. We would very pleased to provide further information about the Inspired Model© and its application on request. We welcome opportunities to partner with interested agencies in the implementation and delivery of our model. Please contact our Director, Tracey Jane, on 8272 6998 or traceyjane@inspiredpsychology.com.au for more information.